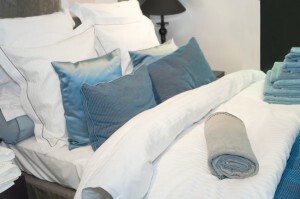 Let Flair help freshen and maintain your home with expert cleaning of household linens and bedding. And, when unexpected guests arrive, our same day service will help them feel comfortable and right at home. Crisp, clean, comforters, duvets, sheets, and pillowcases are the hallmark of fine hotels everywhere. At Flair, our specialists can clean and press your linens so that you can enjoy the same level of quality and luxury at home. We specialize in the care of comforters, down-filled items, bedding accessories, blankets, pillows, and bedspreads. Our sophisticated machines ensure maximum cleanliness and are delicate enough for the finest bedding. Fine linens, whether heirloom or new, require proper care and maintenance to ensure that they stay beautiful. From Battenberg lace and silks to fine embroidery, when you trust your linens to the experts at Flair, you can rest assured that they will be spot-treated and cleaned with extra attention to detail. Our GreenEarth process rinses away cleanly every time. And, our hand finishing ensures stunning results every time.